The Turkish military and Free Syrian Army (FSA) forces have cleared Daesh terrorists from Jarablus to al Bab, and now their eyes are turned to Manbij, which is controlled by the PKK terrorist organization's Syrian affiliate Democratic Union Party (PYD), who hope to carve out an independent state in the region. 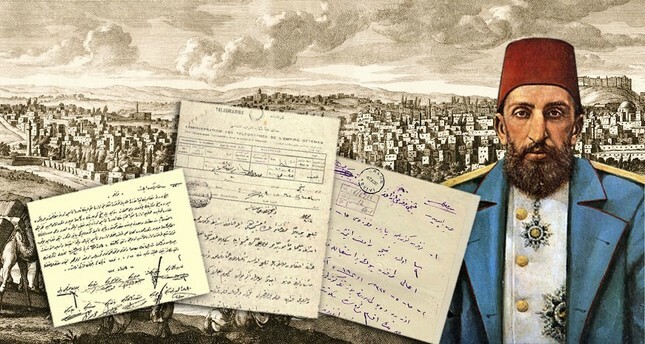 A recently published book sheds light on the Ottoman history of Manbij using historical documents and reveals that the Sultan Abdülhamid II used to own one-third of the land in the city and the surrounding villages. "A Misak-ı Milli [National Pact] L and in the Light of Sources: Manbij and its History," by historian Enes Demir uses historical documents to shed light on the status of the region during the Ottoman period including its demographic structure, the establishment of the Turkish administration, and information on the Empire's decision to withdraw from the region. Manbij came under Ottoman jurisdiction in the 16th century, and Demir's book relies on state archives beginning in that period. According to records, villages had Turkish names in the regions where the Turkmen population lived. After the Russo-Turkish War during the reign of Abdülhamid II, Circassian refugees from Vidin were placed in the region to strengthen the Ottoman central authority. Sultan Abdülhamid was particularly interested in the region, and during this time period one-third of the land in Manbij and the surrounding villages belonged to the Sultan's imperial estate. Manbij remained bound to the Ottoman Empire during World War I. However, shortly after the Armistice of Mudros, Bedouin Arab tribes came to the city. According to an official population report prepared by the Ottoman State in October 1918, Manbij was made up of both Arab and Turkmen administrative districts. After the dissolution of the empire, the French took control of the region, but the new government was met with popular resistance and Turkish administration was re-established in December 1920 and continued until August 29, 1921. The book highlights documents that demonstrate the Manbij population's commitment to the Ottoman Empire during World War I. Documents show that people believed they belonged to the Ottoman State and that they were ready to make any kind of sacrifice in this regard. When the Turkish troops returned to the region in 1921, they were welcomed back with joy by locals. Daesh took control of Manbij three years ago and the city became a center for trading smuggled artifacts to fund the terrorist group. A mosque constructed by Sultan Abdülhamid was bombed to rubble by Daesh in 2014. With U.S. air support, the PYD was able to take control of Manbij from Daesh and now runs the so-called "Manbij Military Council," through which they have declared the city independent from the Assad regime. The U.S. had previously promised Turkey that the PYD would vacate the area after capturing it, but this promise did not come true. Today, Manbij is mainly inhabited by Arabs, with a couple of thousand Kurds and Turkmens living in the area. In February, President Erdoğan said the PKK's affiliate must leave the city, telling Anadolu Agency, "Manbij is not a place for the PYD or YPG … it belongs to Arabs."